My family has been on a quest for a great sour cream based potato salad. There was a restaurant in town that served a delicious one but they are no longer in business. So now every time we have a family barbecue we are at a loss for what to make. I feel like we have tried potato salads from everywhere and nothing lives up to our standard. This weekend my sister and her new family (husband and three kids) came to visit. My mom and I decided to make grilled barbecue chicken for Sunday dinner. This would be easy and not heat up the kitchen! (I’m so ready for fall!!!) To go along with that theme, I decided to make up a potato salad recipe. 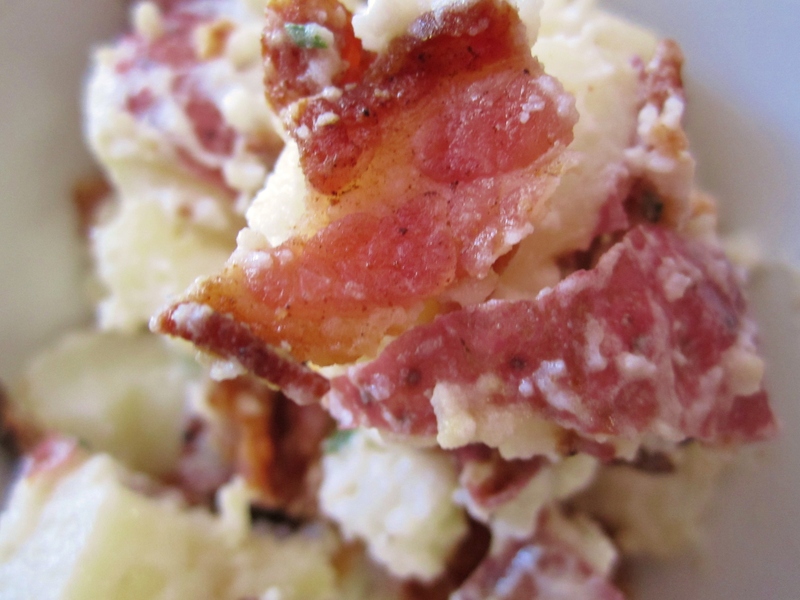 I knew I wanted red potatoes, cold sour cream and super crispy bacon! Boil the potatoes just until tender. Do NOT over cook! This will make your potato salad mushy. While that is cooking, whisk together sour cream, olive oil, milk, vinegar, salt, pepper, black pepper, onions and chives in a small bowl. Refrigerate until ready to use. 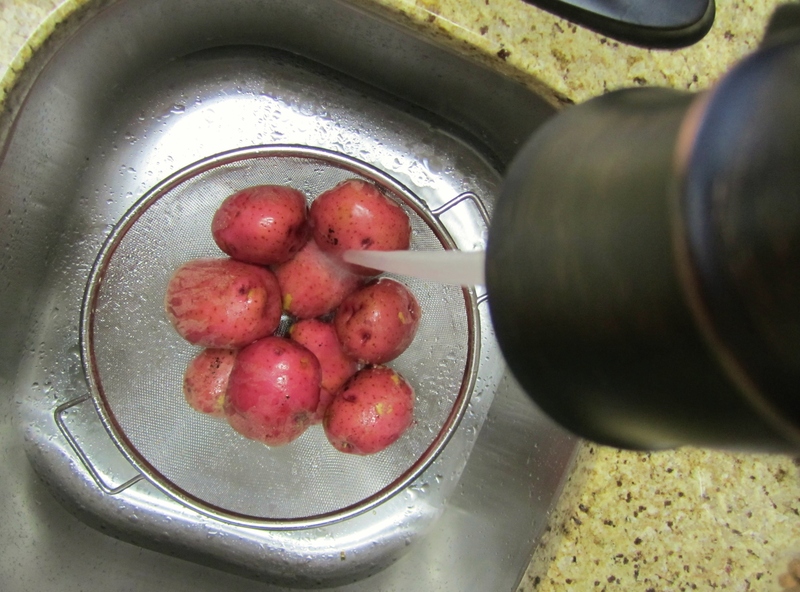 Once potatoes are cooked, run under cold water and let cool down to room temp. While your potatoes are cooling, cook your bacon in a pan until very crispy (Almost burnt). Lay out on paper towels to drain and let cool. Chop potatoes with skin into large chunks and put in a large mixing bowl. Add dressing and mix. Then crumble bacon into the bowl and mix. Serve immediately. If you are not serving immediately, wait to cook/ add bacon until right before serving. Entry filed under: Uncategorized. 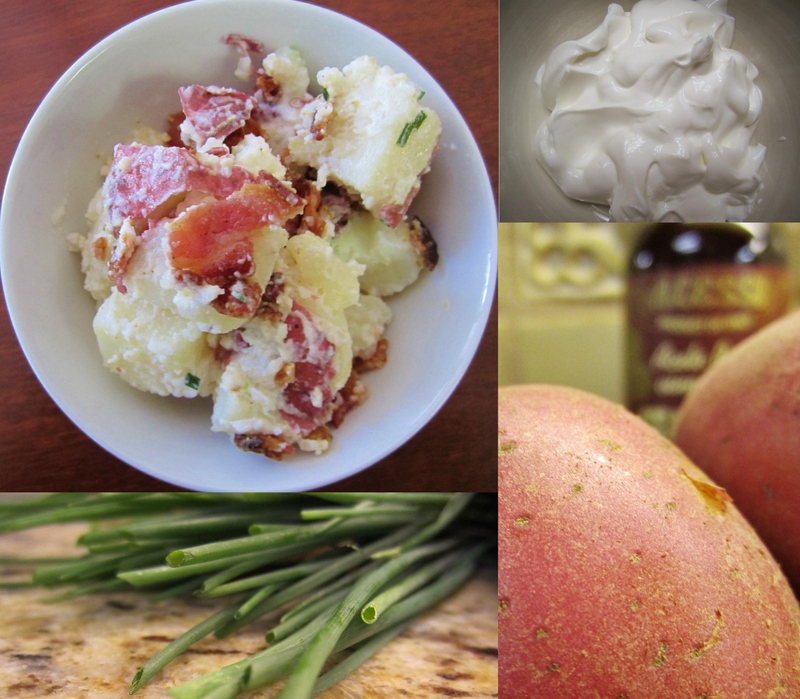 Tags: bacon, Chives, Culinary, potato, potato salad, Recipe, sour cream.